The world of information technology changes rapidly, and at Infotec, we design our courses to change with it. Established in 1988, we’ve developed a reputation for providing world-class IT and Leadership training, quality instructors, cutting-edge facilities, and flexible training techniques. The partnerships that we have formed with many of the leading certification companies allow us to present to our customers the latest in training and testing technologies for their personnel. Every business has their own unique set of challenges. 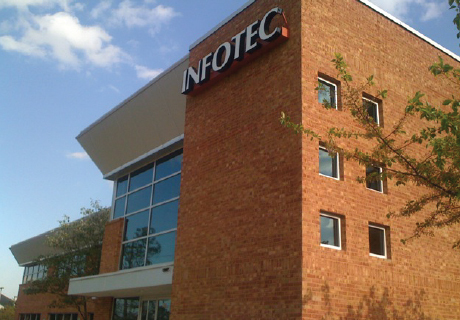 At Infotec, we design custom training solutions to help your IT staff leverage new technologies and improve operations. With Infotec’s abundant offerings, and team of industry experts, we have the answer to help keep your business current and up-to-date. Our courses are offered in many different formats including Instructor led training, virtual training, e-learning training, or a combination of methods. Choose the option that best meets your scheduling and logistical needs, as well as, your budget. No matter which option you decide on, your staff will be learning from our qualified, experienced staff. Let us help your IT staff stay current and help your business grow. Contact us today to see what Infotec can do for you. Infotec has leading edge classrooms at our locations, as well as numerous satellite classrooms, and travel labs to support the requirements of our CONUS and OCONUS clients. The classrooms are carpeted, lighted utilizing parabolic technologies, and are equipped with whiteboards, data projectors, comfortable executive seating, and flat panel screens with a ratio of one computer per student. A student break area with complimentary coffee, hot chocolate, and tea. A courtesy phone, computers for checking emails, vending machines, refrigerator and microwave are all components of the student’s available amenities.